Step 1. Create the objective function. Step 2. Create the training data. Step 3. Set bounds and initial point. Step 4. Find the best local fit. Step 5. Set up the problem for MultiStart. Step 6. Find a global solution. This example shows how to fit a function to data using lsqcurvefit together with MultiStart. The end of the example shows the same solution using lsqnonlin. Many fitting problems have multiple local solutions. MultiStart can help find the global solution, meaning the best fit. This example first uses lsqcurvefit because of its convenient syntax. where the input data is x=(x1,x2), and the parameters a, b, c, and d are the unknown model coefficients. Write an anonymous function that takes a data matrix xdata with N rows and two columns, and returns a response vector with N rows. The function also takes a coefficient matrix p, corresponding to the coefficient vector (a,b,c,d). Create 200 data points and responses. Use the values a=-3,b=1/4,c=1/2,d=1. Include random noise in the response. Set bounds for lsqcurvefit. There is no reason for d to exceed π in absolute value, because the sine function takes values in its full range over any interval of width 2π. Assume that the coefficient c must be smaller than 20 in absolute value, because allowing a high frequency can cause unstable responses or inaccurate convergence. Set the initial point arbitrarily to (5,5,5,0). Fit the parameters to the data, starting at p0. lsqcurvefit finds a local solution that is not particularly close to the model parameter values (–3,1/4,1/2,1). Create a problem structure so MultiStart can solve the same problem. Solve the fitting problem using MultiStart with 50 iterations. 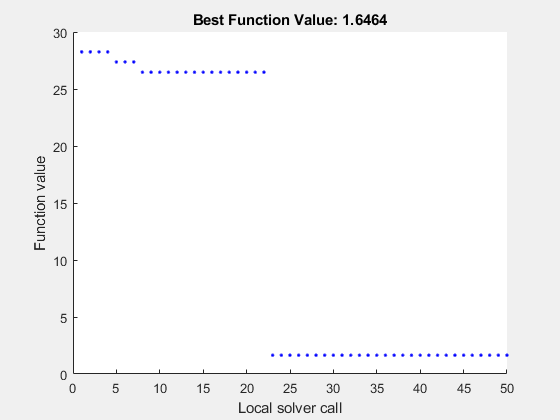 Plot the smallest error as the number of MultiStart iterations. MultiStart completed the runs from all start points. 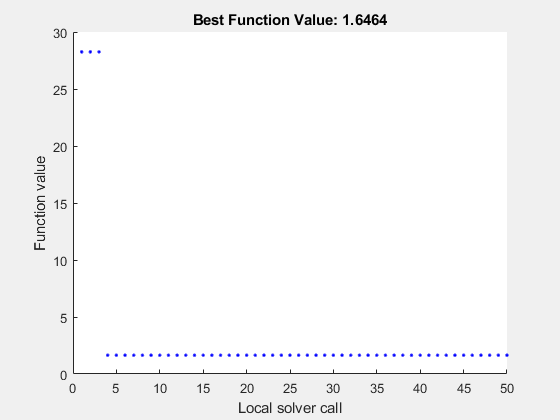 All 50 local solver runs converged with a positive local solver exit flag. MultiStart finds a global solution near the parameter values (–3,–1/4,–1/2,–1). (This is equivalent to a solution near preal = (–3,1/4,1/2,1), because changing the sign of all the coefficients except the first gives the same numerical values of fitfcn.) The norm of the residual error decreases from about 28 to about 1.6, a decrease of more than a factor of 10. For an alternative approach, use lsqnonlin as the fitting function. In this case, use the difference between predicted values and actual data values as the objective function. Starting from the same initial point p0, lsqnonlin finds the same relatively poor solution as lsqcurvefit. Run MultiStart using lsqnonlin as the local solver. Again, MultiStart finds a much better solution than the local solver alone.